Questions, answers and support. Post your general questions here. Support for installation and upgrade issues. 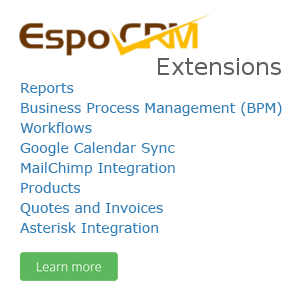 Talk about extensions for EspoCRM. The issues related with development. Please let us know if you find any bug. Most users ever online was 1,524 at 03:50 AM on 04-23-2019. Do You Offer EspoCRM Development or Consulting Service? Need a translation to native language or want to improve existing one?